Rating: 8.6/10. From 26 votes. 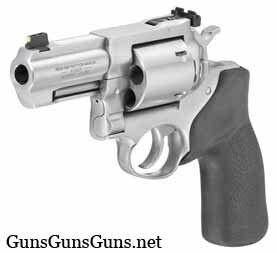 Summary: The description, specs, photos and pricing for the Ruger GP100 revolvers, plus user ratings and comments. 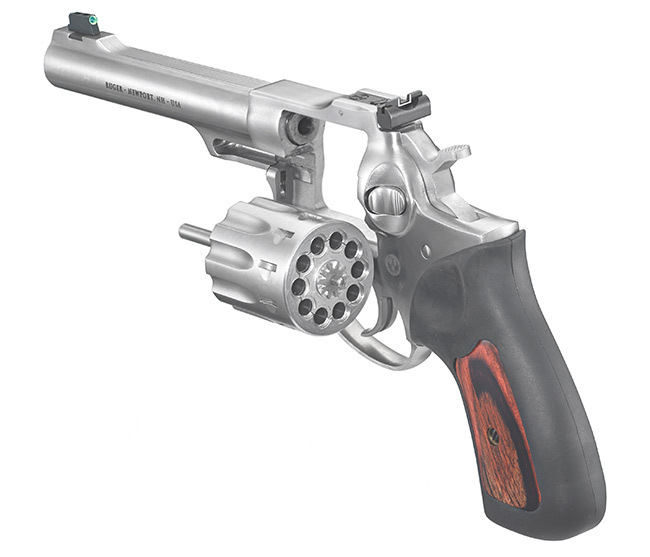 The Ruger GP100 is a single-action/double-action revolver built with solid steel sidewalls (no side-plates) and full-shrouded barrels (aside from the .22 LR model), and chambered in .44 Special, .327 Federal Magnum, .357 Magnum (an of course .38 Special), and .22 LR. The GP100 is available in blue, satin stainless or stainless finishes, and with five barrel lengths: 3″, 4.2″, 5″, 5.5″ and 6″. It features a fixed front sight (ramp on centerfire models, fiber optic on the .22 LR model), and an adjustable rear sight. The triple-locking cylinder is locked into the frame at the front, rear and bottom for more positive alignment and dependable operation shot after shot. The patented Ruger transfer bar mechanism provides security against accidental discharge. Take down of integrated subassemblies requires no special tools and allows for no hassle maintenance and assembly. The grip frame design accomodates a variety of custom grips. The GP100 typically comes with a black Hogue Monogrip, although the .22 LR model comes with a cushioned rubber grip with a hardwood insert. The SP101 comes with a hard plastic case. On camera: Check out Hickok45’s video reviews of the GP100 chambered in .44 Special and GP100 chambered in .22 LR. .22 LR 10 5.5″ 11.3″ 42 oz. .327 Federal Mag 7 4.2″ 9.5″ 40 oz. 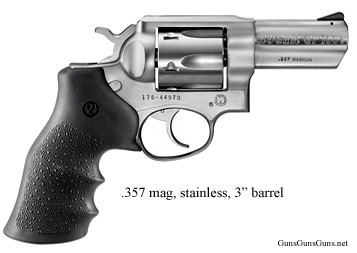 .357 Mag, .38 Special, .38 Special +P 6 5″ 10.38″ 43.5 oz. .357 Mag, .38 Special, .38 Special +P 6 6″ 11.5″ 45 oz. .357 Mag, .38 Special, .38 Special +P 6 3″ 8.5″ 36 oz. .44 Special 5 3″ 8.5″ 36 oz. 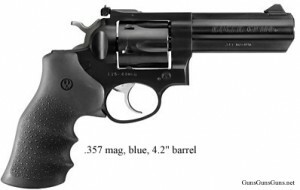 The GP100 in .44 Special. The GP100 with the 5″ barrel. The GP100 chambered in .22 LR. This entry was posted in .22 LR, .327 Federal Magnum, .357 Magnum, .38 Special, .38 Special +P, .44 Special, $251-$500, $501-$750, $751-$1,000, Full size, Revolver, Ruger on July 22, 2010 by Staff. 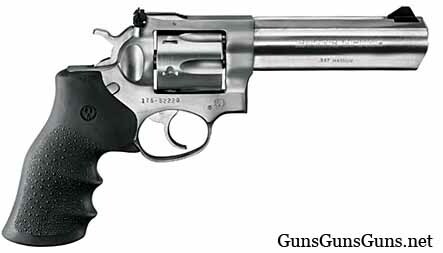 Ruger’s GP100, Quality and Customer Service get 10 stars in my opinion without hesitation on my part. Fantastic gun comfortable to shoot. Used 38 special loads. 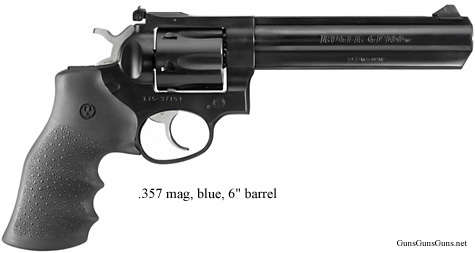 And the very big 357 mag.125 SJSP, which was like shooting A cannon. But no matter which load I shot the gun was very easy to control. Purchased it in stainless with 6” barrel. I have been a fan Ruger wheel guns since the late 70’s. The GP 100 is and shall continue to be the epitome of shooting pleasure. Starting withe the Security Six’s and ending with the GP series, I can see why Colt stopped making their d/a wheel gun. They simply could not compete.